Book suggested for rating by Vespasiano. 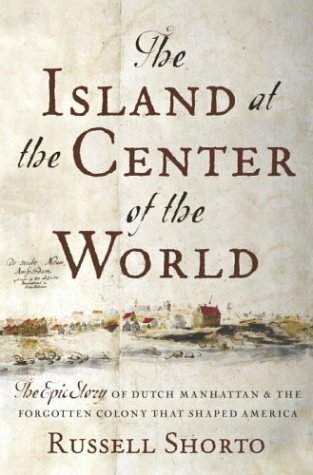 Russell Shorto's book, the Island at the Center of the World, is a retelling of the story of the earliest decades of Dutch New Amsterdam and the importance of the New Netherlands colony (an area encompassing modern Delaware, Eastern PA, Maryland, New York to Albany, and western Connecticut) to the subsequent history of what would become the United States and the City of New York specifically. The book owes much of its material to the latest historical scholarship of the period, particularly the work of Dr. Charles Gehring of the New Netherland Project who, since 1975, has been translating thousands of pages of documents that have survived from the early 17th Century. Until Dr. Gehring began is work, the vast bulk of this material had never been translated (17th Century Dutch is quite different from its modern version, and the archaic script undecipherable to all by a literal handful of specialists). Consequently, this never-before-studied material is shedding a new historical light on the Dutch contribution to the American story. Until Dr. Gehring began his work, the history of New Amsterdam and of New Netherlands generally was portrayed as chaotic and essentially inconsequential relative to developments in the British New England and Virginia colonies. In Mr. Shorto's view, however, that dismissive history was essentially a later British telling of the Dutch story and was a byproduct of Britain's having eventually gained the upper hand in her 17th Century rivalry with the Dutch Republic for global power. Mr. Shorto's book represents an effort to correct this impression. In fact, building upon Dr. Gehring's work and that of a whole new field of experts that has grown over the last 30 years, Mr. Shorto sets out to show that the birth of the future United States and, specifically, of New York City in all its cosmopolitanism, owe as much if not more to their Dutch heritage as to their more familiar British one. In addition to providing a good portrait of the thriving, liberal, outward-looking, technologically advanced (for the time), polyglot, artistic, scientific, intellectual and commercial mecca that was 17th Century Holland (these were from the very beginning characteristics of New Amsterdam and later New York City), a central focus of Mr. Shorto's book is, Adriaen van der Donck, about whom very little was known or remembered and who it is fair to say Mr. Shorto sees as the first true American. Van der Donck was one of the first individuals known to history to use repeatedly and consistently the term "American" to describe not only the Indian people but, specifically, himself and his fellow New Netherlanders. Van der Donck saw America for the new opportunities it presented rather than as a mere outpost of old Europe -- he viewed himself as a new man, and he along with other members of the new community, recognized that New York's great natural harbor would be the hub and gateway to the rest of the continent. In opposing both van Rensselaer's and Peter Stuyvesant's neo-feudal authoritarianism (although the newly translated materials point to Stuyvesant's having been, in certain respects, a far more effective director of the New Amsterdam settlement than had previously been thought), van der Donck proved a forceful advocate for republicanism, representative government and objective standards of law equally applied (a lawyer himself, he was a product of the great University of Leiden and a pupil of Grotius). For Mr. Shorto, then, van der Donck was truly one of the original Founding Fathers of the United States. All in all, the Island at the Center of the World presents a fascinating thesis, and is a wonderful, even exciting read. The Dutch preference for establishing trading and military joint posts where locals could choose to come to trade with them, rather than setting themselves up as governors of the existing population, was a huge difference from the English approach. The Dutch held their expectation to deal with traders, and did not rely on convincing any group with force. The book narrates how the Dutch character was the cement between English and Dutch that clearly make America different from any other nation that came before or since. It could not have been done without maintaining deep connections with what was then the world's only other trading empire worth noting (in my view). The guarantee of rights Stuyvesant and his English counterparts pushed for had not existed in any English colony, but had clear resemblances to the administration and rights in the Dutch provinces. Add to that the tendency of the Dutch population to recognize individual achievement as more meaningful than inheritance or class, and the Dutch respect for private spaces specific to individuals was unparalleled in the 17th century. One of the many interesting mentions is the concurrent use of multiple currencies, but the endnotes unfortunately lack any reference to scholarly research or original tracts. I found the book enjoyable for its bibliography, and its rebuttal to Anglocentrism of America's origins, but would have liked larger and more maps, and a larger portion of the book devoted to the significance of the Articles of Capitulation in rights protection, which received too little factual attention amid Shorto's musings. The book would have been improved by being four times its length without that being a deterrence. The bibliography has excellent sources for those interested in the Dutch enlightenment in America, including topics such as the origin of the First Amendment and the origin of the District Attorney. I very much agree with your assessment of Mr. Shorto's book and consider this sentence, in particular, to be quite well put. The book narrates how the Dutch character was the cement between English and Dutch that clearly make America different from any other nation that came before or since. I do disagree with you on one point, however. Mr. Shorto is not a professional historian but, rather, an inquisitive and intelligent journalist. His book is not intended as a scholarly presentation rich with the kind of detail and analysis one expects from such a work. It is, on the other hand, an introduction to and summary of new developments in historical research, and, crucially, it is directed at the lay reader who might be wholly unaware of that research and the new light it is shedding on 17th Century America. In addition, because it both excites the reader's imagination and whets his intellectual appetite for more, it is an excellent one in my view. I, took, look forward to lengthier, more detailed scholarly works on this subject, but these will necessarily come from the experts in the field. It is, on the other hand, an introduction to and summary of new developments in historical research, and, crucially, it is directed at the lay reader who might be wholly unaware of that research and the new light it is shedding on 17th Century America. In addition, because it both excites the reader's imagination and whets his intellectual appetite for more, it is an excellent one in my view. I, took, look forward to lengthier, more detailed scholarly works on this subject, but these will necessarily come from the experts in the field. I think the lay reader, which I am, can be presented with scholarly material without it becoming stuffy for the intended audience. A reader's interest could grow by Shorto publishing an interview about one of the few Dutch-focused libraries or archival collections on our continent in a magazine of wide circulation, briefly exploring the America the majority never knew in a compelling way and it would serve as an excellent introduction to the research. There are bits he could write up in Hali about the Dutch passion for rugs while in America, to briefly gloss over the sort of rare research done into the origins of America. These are a couple of random examples that occur to me just now, but it is the good writer who can take wampun currency or the Dutch military occupying the highest geographic elevation in the Dutch empire and narrate them in depth (after all of Shorto's research, what a waste not to truly apply it!) for any lay person who bothered to pick up a book with a compelling title and dust jacket. And who can resist the words 'epic' and 'forgotten colony that shaped America'? The contents should reward the lay person's interest in the book's outward appearance, and reward him well. There are bits he could write up in Hali about the Dutch passion for rugs while in America, to briefly gloss over the sort of rare research done into the origins of America. Uhhhh . . . no. Don't get me wrong: I like a good rug as well as the next fellow, and I'm quite certain that such a topic would be fascinating. If not Mr. Shorto, I have no doubt there are some writers out there (you, perhaps?) who might wish to devote a book to it or some of the other topics you mention if, in fact, they have not already done so. However, a focus on this type of thing, though certainly a worthy if somewhat narrow enterprise, would have been quite beside the point of Mr. Shorto's particular work which was precisely to introduce -- indeed to advertise -- in broad terms what some of that "rare research done into the origins of America" is revealing about the individuals (on both sides of the Atlantic) who made it happen in New Amsterdam, and the revolutionary ideas that not only fueled their actions but that would become a central part of the intellectual fabric of America. As far as I'm concerned, Mr. Shorto is quite good enough as writer to have done what he set out to do. But I won't belabor the point further: this appears to be a case of "different strokes for different folks". I don't get you wrong, Vespasiano, but I don't think I've conveyed my meaning. The point would be not what rugs they brought or imported or craved, but what were the ideas that made such goods in America possible for them at all. The transactions of those rugs is evidence all the people who fall under the term "Dutch" did not simply disappear after the English assumed control, and the system uniquely created here and nowhere else. What led up to that changeover has everything to do with Mr. Shorto's book. ...All in all, the Island at the Center of the World presents a fascinating thesis, and is a wonderful, even exciting read. *It was not until Ayn Rand that a proper, this worldly/non-mystical, fundamentally sound definition of individual rights was once again placed back at the core of a rights respecting society which hopefully has an even more profound effect than the earlier great minds mentioned above. One of the few things that I can state that I did not like about the book is the authors constant use of the terms "diversity" and "tolerance" as if they are or were the seeds of liberty/freedom. Of course they are not the cause and instead they are an effect of the recognition and defense of individual rights of which Hugo Grotius and Adriaen van der Donck started and John Locke finished in the 17th century and soon after it's demise began. I did not find Mr. Shorto's repeated references to the terms "diversity" and "tolerance" to suggest that he viewed them as deterministic causal agents in the development of the principles of liberty and freedom on the American continent. As Mr. Shorto makes abundantly clear, those characteristics of the New Amsterdam colony were, among others he explores (mercantile interests, trade, etc. ), simple facts of life there and central to what distinguished it from the bulk of its British neighbors wherein religious authoritarianism continued to be, throughout the 17th Century at least, a predominant feature. They were much the same as those that distinguished Holland from England throughout the better part of 17th Century and that made Holland the intellectual mecca it was (it was not mere whimsy, after all, that brought John Locke to Holland when he was forced to flee England). In my view, implicit in both the general outlines of Mr. Shorto's survey and his repeated use of the terms is that diversity and tolerance were the natural consequences of the ideas the 17th Century Dutch settlers brought with them from Holland. In fact, this speaks to the general thesis Mr. Shorto presents: that the legacy of Dutch ideas (as opposed to contemporary British ones) that, antecedent as they were to those so fully explored later by John Locke, ought to be viewed as having formed a first foundation not only for what would grow into a distinctive American national character and sense of life, but for those distinctively American social and political arrangements as well. Mr. Shorto's book is a challenge to the prevalent view today that these are almost wholly of a uniquely British origin. Interests:Science fiction, classic literature, movies, TV, music (mostly classical). I don't know whether it was based on the book, but there was a PBS documentary last year that covered the same ground and from the same perspective. Can't find a DVD for it in a quick search, but there mat be one. Before I bring some facts to support my earlier claim I want to state that for the most part I enjoyed reading Russell Shorto's book and found it enlightening, as the information on the Dutch Colony of Manhattan was either lost, forgotten or not well known until now. Vespasiano, I disagree with your view and offer some passages from the book to back my claim (of which I have highlighted a few words). "If what made America great was its ingenious openness to different cultures, then the small triangle of land at the southern tip of Manhattan Island is the New World birthplace of that idea, the spot where it fiirst took shape." "The Pilgrims story was simpler, less messy, and had fewer pirates and prostitutes to explain away. It was easy enough to overlook the fact that the Puritans' flight to American shores to escape religious persecution led them, once established, to institute a brutally intolerant regime, a grim theocratic monoculture about as far removed as one can imagine from what the country was to become." "One difference between England and the Dutch Republic was contained in the abstract and to our ears wan-sounding noun tolerance. England was on the verge of a century of religious wars that would see royal heads roll and crowds of ordinary citizens flee. The Dutch - traders and sailors, whose focus was always out there: on other lands, other peoples, and their products - had always had to put up with differences. Just as foreign goods moved in and out of their ports, foreign ideas, and for that matter, foreign people, did as well. To talk about "celebrating diversity" is to be wildly anachronistic, but in Europe of the time the Dutch stood out for their relative acceptance of foreignness, or religious differences, of odd sorts." Throughout the whole book Russell Shorto keeps emphasizing tolerance and diversity as what seems to me to be what he considers essential aspects of a free country. No mention of what is truly essential, such as the recognition of individual rights, and that it is that common held principle or view that allows the Dutch colonist to come together even though they are from diverse cultures.